Food and all things cookery related, that covers most of life, eh? You have to take a long run at Christmas to be relaxed and produce great food over almost a full week to a house full of people. Its all good fun and adds to my enjoyment, but it does not happen by accident that the house is full of good thing to eat and there are wonderful smells coming from the kitchen where the oven is rarely turned off. 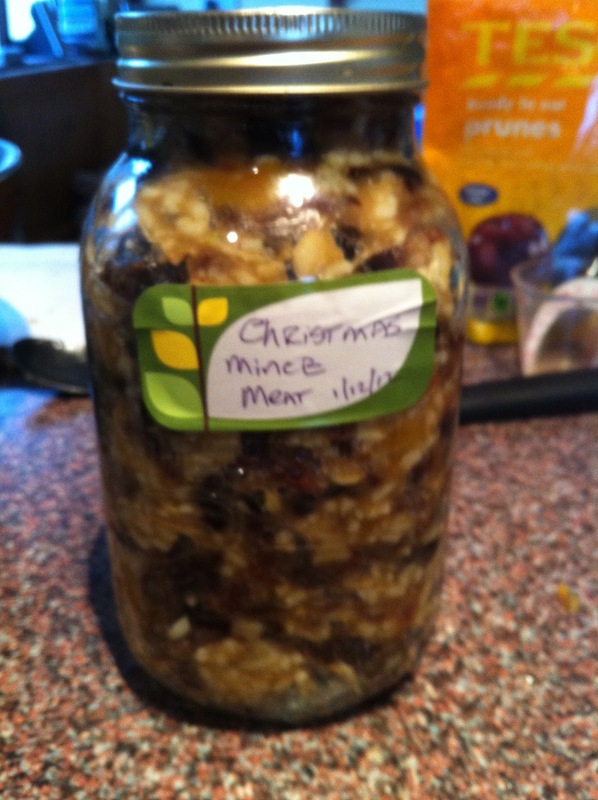 I like to start by making the mince for the pies, the pudding and the cake by the end of November, early December. Today I mixed the mince for the pies. This is based on a recipe from the original Myrtel Allen book, "The Ballymaloe Cookbook", one of the first books I owned and I have made almost every recipe from it. Yes, Darina Allen was a great cook and now, Rachel Allen too, but it all started with Myrtle and her gentle writing and encouragement that two good free range eggs boiled, served with homemade brown bread was a far better supper than anything reheated from the supermarket. I have added a few extra bits to her recipe, as I like a few glistening red cherries in there too, I like a few toffeeish dates, and a handful of nuts, but it is her addition of a tablespoon of orange marmalade that turns a bowlfull of dry ingredients into a beautiful moist mass of juicy fruity lovelyness. I don't know why a tablespoon of one ingredient can do this, but it does. I like packing it away into a few jars and looking at it in the back of the cupboard in the smug knowledge that I can whip up a dozen mince pies at twenty minutes notice. This recipe will make about 30 pies, enough for my family over Christmas. 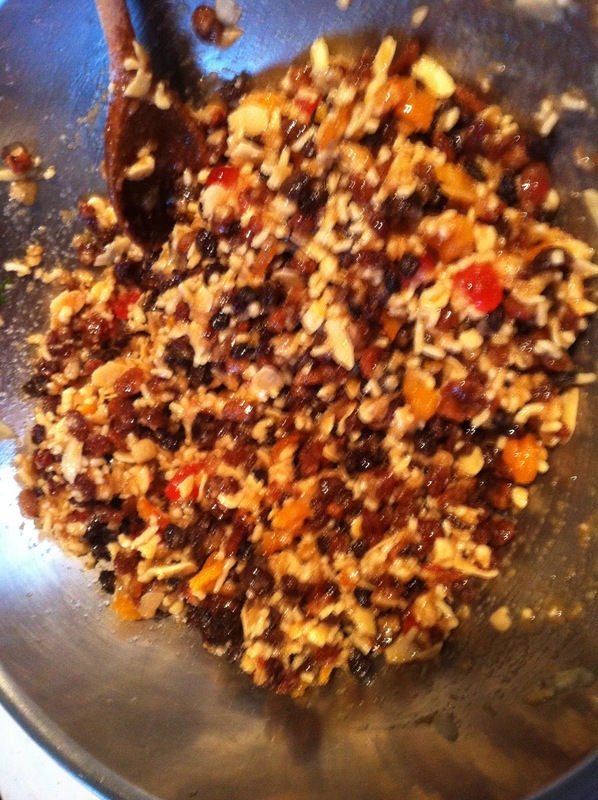 Mix everything into a bowl and stir thoroughly. 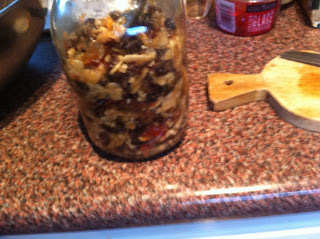 When it is very well mixed, put it into jars (mine filled 3x12oz jam jars) and cover closely. Make sure you pack it down tightly. When you are ready to use it, tip it out into a large bowl and stir well again. It makes a lovely present too if you want to give any of it away! So, this is what I did with it over Christmas. I was busy and did not have time to make individual pies, so I made one large pie in a rectangular tin to cut into slices. I often do this with mince pies as I like more filling and less pastry. 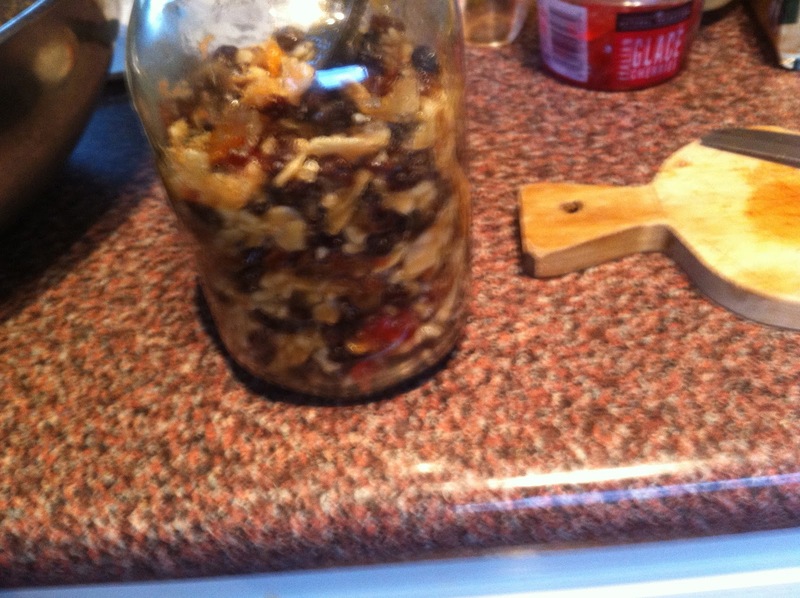 I added a layer of apple, a sliced Brambley, to add a fresh zing to the mince. The sweet pastry is the same as from the Lemon and Lime pie recipe here. It was lovely, rich, biscuity and very Christmassy! I does not need to be baked blind, just rolled out and filled. Rotolo, a new way with pasta by Jamie Oliver..